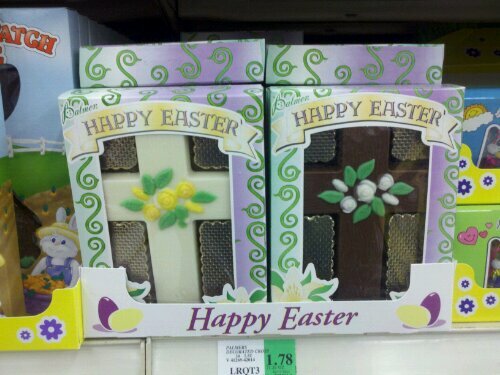 Every year I see these, and every year my brain wonders. 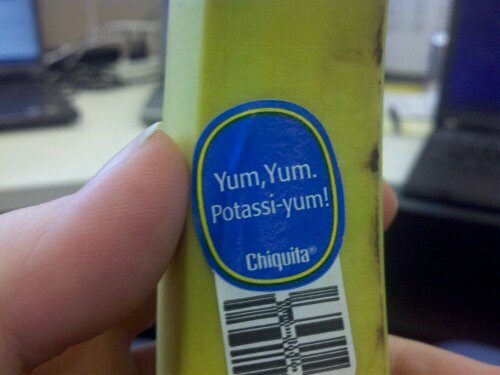 So, Internets, I turn it over to you. Is this blasphemy? Why or why not? Separate to that question, is it in good taste? Poor Ebony-kitty finds herself on the wrong side of the glass to go chase the robin on the patio. We’re so mean to her. So I got a new hard drive for Christmas. 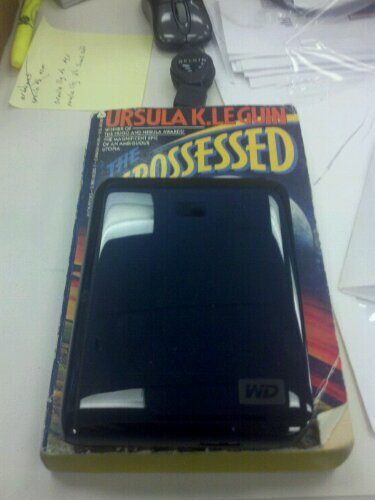 It astounds me that something smaller than a standard paperback novel holds 1 terabyte of data. Even more astounding, it cost less than half of the six gigabyte drive I bought in 1998. The future is now, and it’s truly awesome. 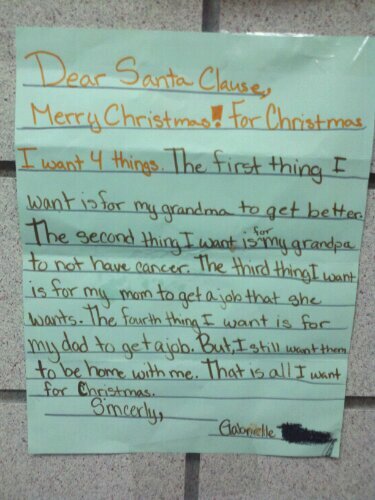 No kid should ever have to write a letter like this to Santa Claus. Never. It was fun fighting that, when you couldn’t read signs until you were almost on top of them, and people disappeared into the fog way too easily. I found this in the grocery store last night. Me: I’m afraid to look at how many calories that has. Jill: (flipping package over): Servings per package: 12. Calories: 200. Calories from fat: 90. Me: Yeesh! That’s one-sixth of one cup per serving. 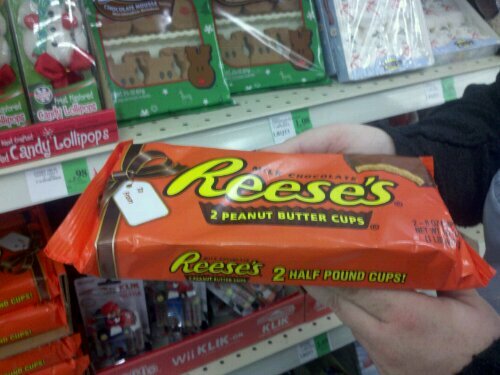 So I guess if you really like Reese’s, this might be worth it. Just keep in mind, one cup is more than half your RDA. 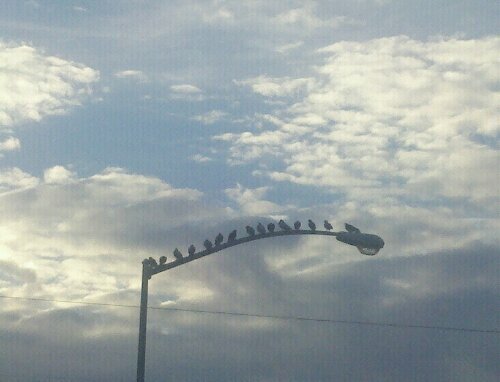 Caught this shot of a bunch of what appeared to be pigeons on top of a light pole. With the clouds, it made for a beautiful shot. 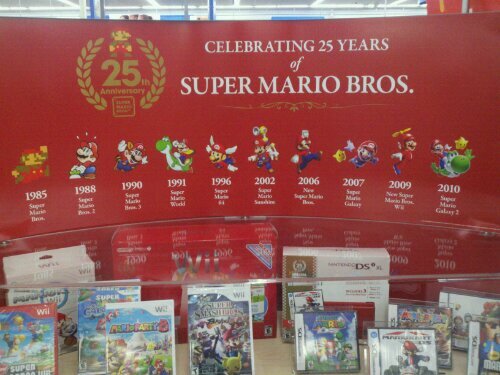 A display in the Walmart near the house. 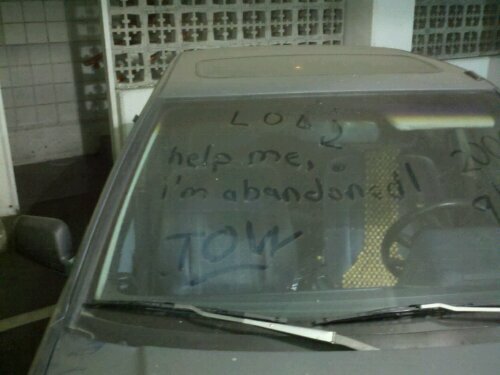 This is an abandoned car in the parking garage I park in. I don’t care if you’re Consumer Reports. 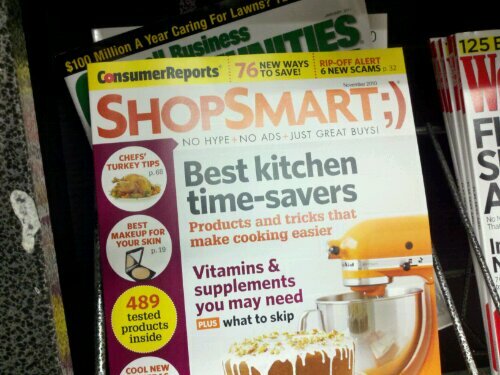 Emoticons are not a good idea in the title of your magazine. So it was the shindig for my grandparents’ fiftieth wedding anniversary tonight. 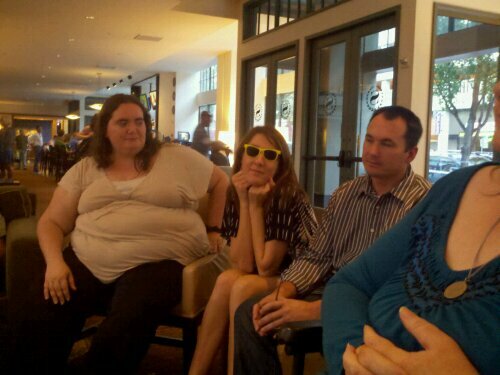 Before we all went over to the restaurant, we hung out in the hotel. My uncle found the shades in the pocket in the back of Mom’s wheelchair and soon enough, my cousin Steph was rocking them. In the pic is Jill, Steph, and Steph’s boyfriend Mike. Happy anniversary, Nanny and Papa! 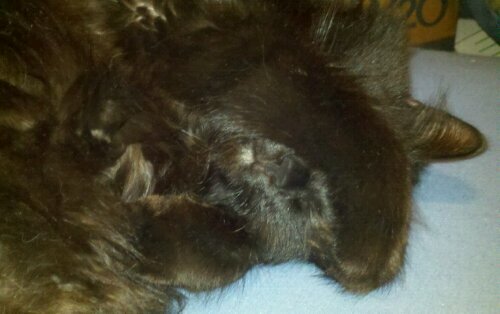 There are some mornings when Ebony is being unbelievably cute. The first fog of the year has come to Sacramento, shrouding the skyscrapers in mystery. I had to get to work early, so I managed to catch them in that peaceful moment when it’s not night anymore, but it’s not really day yet either. It’s perfect. It made me laugh. So I asked over on Addicted to Quack, an Oregon sports blog, about what that truck was. And sure enough, my guess was right. You see, the Ducks played Tennessee in Knoxville on Saturday night, and the afternoon commute hours today were just right for the Ducks’ equipment truck to be passing through Sacramento on its way home to Eugene from that game. I wonder if Cal has a similar truck?